U.S. consumers are spending $1 in every $5 dollars in the household on health care, and personal cost curves aren’t going to bend down anytime soon. Three surveys published in April confirm my financially unwell forecast for American health citizens. Making information comparing the quality of health care provided by doctors and hospitals more available to patients, for 54% of people – 64% Democrats, 46% of Republicans. Consumers are also feeling the cost-pinch of deductibles, which are fairly new health plan features for most insured people in the U.S. 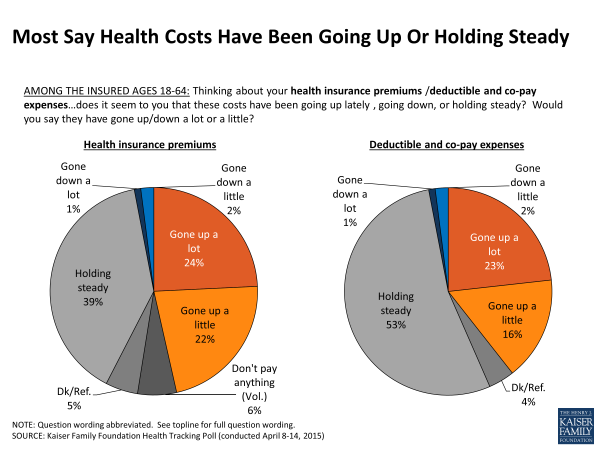 The second chart from the KFF poll shows that 1 in 3 people with health insurance say the deductible is difficult to pay before health insurance kicks in. Another survey, from TransUnion Healthcare, diagnoses shared pain between both consumers and hospital management with health care costs. The source of the health cost “squeeze” for patient and provider is the fact that in 2014, consumers’ ability to pay for certain medical procedures fell by 11% during 2014, while availability of credit tightened. TransUnion calculates that deductibles have nearly doubled over the past five years (via the growth of HDHPs in both employer-based plans and ACA insurance exchange plans. TransUnion forecasts that deductibles will increase going forward, and will require much greater access for consumers to transparency tools and information on health care prices in their community. As the KFF surveyed consumers point out, they are feeling the cost of prescription drugs in their out-of-pocket spending, or that of family and friends. IMS Institute for Healthcare Informatics’ latest read into the topic found that prescription drug spending increased 13% in 2014, faster growth in Rx costs than any year since 2001. The cost growth is due to new specialty drugs being prescribed — a $20.2 bn increase in 2014, three times the amount in 2013. These included innovations for oncology, autoimmune disease, HIV, MS, and hepatitis. Unpacking the specialty drug growth, note that the percent increase was 26.5% — without hepatitis C therapies, 16.3%. Furthermore, IMS Institute says that Medicaid was the #1 driver of retail prescription growth as the Affordable Care Act expanded access to newly insured people for health care — and prescription drugs. Health Populi’s Hot Points: As consumers’ financial health stressors increase, new entrants to the health insurance world are looking to lessen peoples’ pain points, and investors like the idea. In the past week, three new-new health plan companies received financing to the tune of $145 mm for Oscar, the New York-based health plan innovator; SimplyInsured, garnering $1.75 mm in seed funding; and, Gravie, attracting $12.5 mm in venture capital, to expand its concierge-type service for selling health insurance through small and mid-sized employers. Gravie is partnering with Target to channel health plans, another sign of growing retail health alliances getting to people where they live, work and shop. Oscar is valued at $1.5 bn, which is a nice number considering the plan has 40,000 members. While Oscar began in NY, the company is looking to expand in California. These new entrants are attracting business for a growing cadre of health consumers seeking to DIY health via mobile and easy on-ramps to services, appointment making, and payment.